Mugshot courtesy of the Bernalillo County Metro Detention Center. Update April 28, 2015 – the UFC has now acted and they have stripped Jon Jones of his title and suspended him indefinitely. 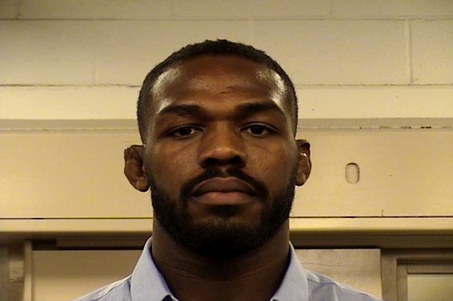 With Jon Jones facing felony hit and run charges after he allegedly fled the scene of a motor vehicle collision in Albuquerque this weekend (Jon Jones Arrest Warrant Affidavit), the pressing question is whether he will still be allowed to participate in his scheduled UFC light heavyweight championship defense against Anthony Johnson at UFC 187 in Las Vegas. Innocent until proven guilty, right? Not necessarily. While this is a tenet of criminal law, in the contractual relationship between the UFC and Jon Jones and the regulatory relationship between the Nevada State Athletic Commission and fighter there is authority to pull the plug if the will is there. The UFC requires athletes to comply with a broad “Fighter Conduct Policy” which prohibits not only “criminal offences“, but also “conduct that undermines or puts at risk the integrity or reputation of the UFC” and lastly “conduct that undermines or puts at risk the organization or promotion of a UFC event“. Breaches of this policy allow the UFC to “impose disciplinary measures on the fighter as warranted in its sole discretion“. Similarly, the Nevada State Athletic Commission enjoys powers to suspend the licence of an unarmed combatant who is simply “arrested” for a crime involving moral turpitude. Specifically NAC 467.887 reads as follows “A license issued by the Commission may be suspended if the holder is arrested or convicted on a charge involving moral turpitude“. Not only can the NSAC suspend Jones’ licence if they conclude he misled them in the wake of the Daniel Cormier press conference fight, but they can also seek to rely on the above legislation (although it can be argued that felony hit and run does not meet the definition of a crime of moral turpitude) if they want to draw a line in the sand. Both the NSAC and the UFC have options to explore if they want there to be consequences for Jon Jones’ actions. The question is do these organizations want to pull the trigger or would they rather leave UFC 187 undisturbed? Now that their headliner to the main event has been pulled from competition. Should a refund be offered to individuals who purchased a ticket prior to 4/28/15 under NAC 467.255? (b) Provide such notice at least 24 hours before the first contest or exhibition of the program. Ê The promoter shall also conspicuously post the change or substitution at the box office of the premises where the program is to be held and cause the change or substitution to be announced from the ring or, if the program is being held in a fenced area, from the fenced area, before the first contest or exhibition of the program. 2. If such a change or substitution occurs and any patron desires to have the price of his or her ticket refunded, the promoter must refund the patron’s money if the patron presents the ticket or the ticket stub at the box office before the opening contest or exhibition of the program is scheduled to begin. The box office must remain open a reasonable length of time to redeem such tickets.